Geek's Guide to Britain For the last 13 years, a tiny train tunnel running through the centre of London has remained empty and unused, maintained by just four engineers. But these engineers don’t work for Transport for London or Network Rail – they work for the Royal Mail. The small gauge tunnel, running for 10.46km (6.5 miles) from Paddington to Whitechapel, 70 feet (21 meters) beneath the ground is the London Post Office Railway, more commonly known as the Mail Rail. From 1927 to 2003, 50 driverless, electric trains shifted 30,000 items each day, running up to every five minutes during peak times, serving eight stations and major sorting office beneath the snarl of urban traffic overhead. Now, it’s set to become London’s latest tourist attraction, as The Postal Museum and Mail Rail in 2017 to reopen the section that runs underneath Mount Pleasant in Farringdon. Eventually, there’ll be a new museum, café, gift shop and all the trappings, but on the day of El Reg’s visit, it’s all hard hats and high-vis vests. A small group of us are getting a guided preview of the Mail Rail attraction, with a tour through the Mount Pleasant depot and its two station platforms. We’re walked through a very small door and down some industrial stairs by Ray Middlesworth, a railwayman since the Mail Rail was still running and still an engineer for Royal Mail. Below is a fitting room and depot, where Mail Rail trains were loaded, offloaded and repaired when the trains were running. In its heyday, the two-foot, narrow-gauge driverless railway called at eight stations along the way, including the largest at Mount Pleasant. 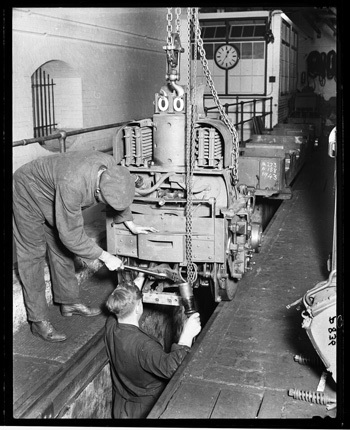 But by the end of its life, the Mail Rail was only stopping at three stations, as sorting offices were moved out of central London to the boroughs. “The closure was more down to the fact that the offices it served were changing, the process by which mail was processed was changing and the mainline rail trains were no longer going out of Liverpool Street and Paddington than cost,” explained Chris Taft, head of collections at the museum, told me after the tour. Despite the decision to close things down, Royal Mail were stuck with underground tunnels. The railway was originally built by order of Parliament - so technically - it belongs to the public. 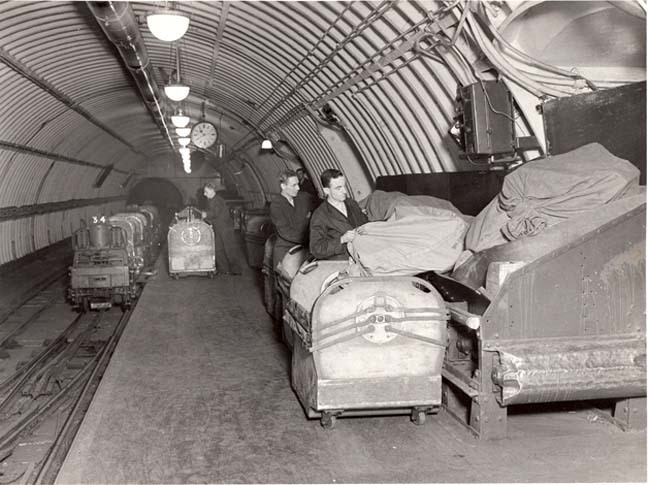 Even though Royal Mail wasn’t using the railway any more, it still had an obligation to keep the tunnels safe and dry and ensure there were no collapses or other potential dangers. Which is how Middlesworth hung onto his job. Middlesworth worked for more than a decade on the Mail Rail when it was running and has spent the last twelve working with three other engineers on upkeep. Down in the depot, he describes a real camaraderie between the workers, who called themselves railwaymen, working long shifts to cover the almost constant running of the network. The trains operated for 22 hours a day every weekday, with the other two hours used for maintenance work. “It’s nice to see it being put to use again!” he told The Reg. The project to turn the Mail Rail into a tourist attraction will give visitors a Postal Museum covering centuries of the Royal Mail’s operation and across the road, the chance to ride the Mail Rail. 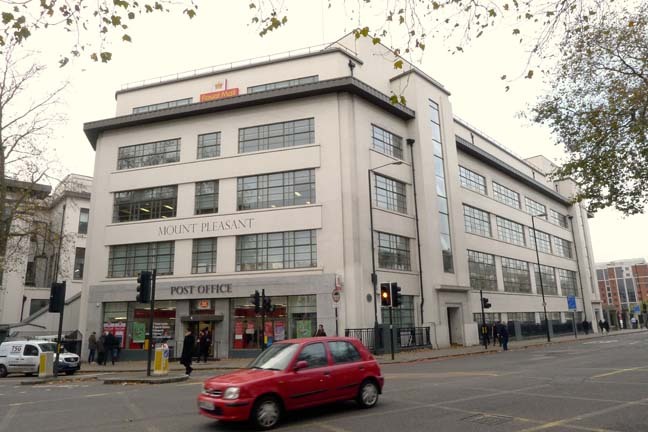 “The total project is £22m to open up the Postal Museum, which will be a brand new museum telling the total communication and design story across five centuries. It will explore the need to communicate that people have had and how that’s happened and how it’s changed over the years,” said Taft. Although work has started on the Postal Museum, the station and platforms under Mount Pleasant had – when I visited - been virtually untouched. In the depot, one train, which is an example of one built in 1980, still sat on the tracks. This one had been refitted with small seats and was used during a Christmas party the Royal Mail had for local disadvantaged children a few years ago. On the walls were a strange combination of new health and safety notices along with old bulletins for rail workers, while paint peeled from the ceiling and ancient-looking yellow loading equipment sat idle. To get to the platforms, our group headed back up the stairs and then through a section of the Mount Pleasant sorting office, past sacks of post, and down a large industrial elevator. As you walk out, a blue map of the system is displayed - clearly for engineers, not visitors - signposted with a mess of indecipherable acronyms and numbers. And everywhere, on nuts, bolts and iron beams, is stamped “GPO”, lest you forget you’re not in a regular Underground station. Here, no-one but Middlesworth and the other three engineers maintaining the tunnels have frequented in many years and the Royal Mail will soon have to think about training up some new staff to keep them up. 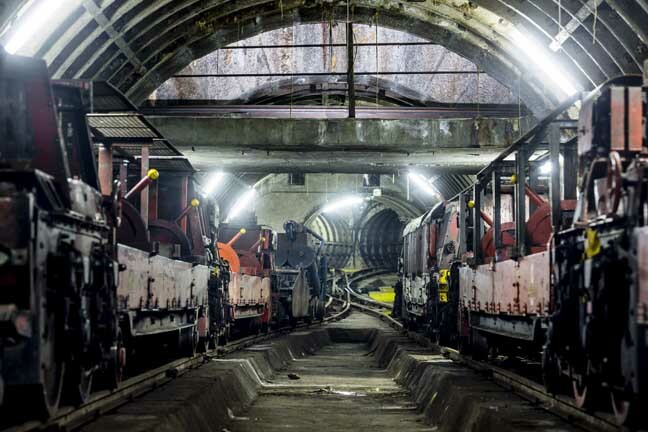 The Royal Mail’s policy has been to only have engineers who staffed the working Mail Rail come back as maintenance engineers, but those ranks are running out. Despite the smaller gauge of the tunnels, the platforms are very much like a rather dishevelled and much older Underground station. Just a (very) small engine for pushing and pulling loading carts is on the tracks and Middlesworth gamely agrees to take it for a little spin up and down to show it off to the visitors. Although clearly in need of some TLC, it’s much easier to see here how visitors will be excited to come down and take a short ride on a small engine. At the time of my visit, firm plans on what the tourist experience would be like were still being made, with a number of ideas floating around, including making use of 3D scans of the tunnels for apps or augmented reality on the tour. “We’ve had 3D scans done of the railway and had it digitally mapped, which would allow us to create some sort of augmented reality. But exactly what we’ll do with that depends on where technology goes and funding as well,” Taft explained. Visitors will do a loop from Mount Pleasant and back for a ride of around 15 to 20 minutes, giving the museum two platforms to refurbish. Another idea that’s been floated is to restore one platform to the 1940s era and another to modern times to give tourists a sense of the history behind the Mail Rail. Although the trains didn’t take to the tracks until 1927, construction had started on the project as much as 14 years earlier. A lack of labour and materials during the First World War halted construction, but did give the government a handy place to store precious art and artefacts. “Construction on it started in 1912, 1913 so by the time of the war, the tunnel was largely complete but the tracks and the electric works hadn’t taken place,” said Taft. “So they used it for storage of paintings and artefacts from important collections in the National Portrait Gallery, the Royal Academy and others. “During WWII, it carried on with its main function. Postal communication was very important during the war and the ability to move the mail underground was a big advantage,” he added. The original plan to build the underground railway evolved in 1911 and the contract was given to John Mowlem and Co, to help the Royal Mail avoid the huge delays horse-drawn traffic was causing around the capital. A report that said that London traffic would never allow for speeds of greater than 6mph convinced MPs to sign an Act of Parliament for a railway that could move mail at 40mph under the city. Most of the line was constructed using the Greathead shield system for tunnelling, with a small amount of hand-mining for connecting the tunnels at the stations. And when it opened, it was the world’s only electric underground railway devoted to transporting the post. 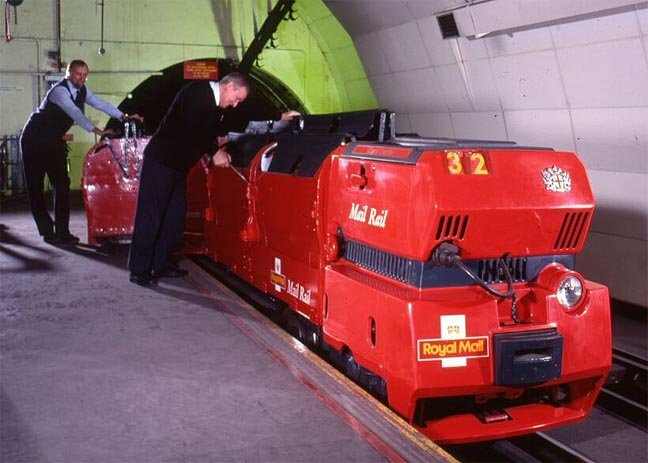 At one point, there were around 220 workers on the Mail Rail, but by April 2003, when Royal Mail announced its closure, that staff was much reduced to cater for just three stations and the cost of keeping the train going had become more than using road transport. The Postal Museum was not the first to come up with an idea for the disused tunnels in the last decade or so, as Taft explains, although no other plan has gotten this far. “There have been a number of suggestions over the year, but none of them have really gotten anywhere. There was a suggestion that it could be used as an underground conveyance for shops under Oxford Street for example, as a service tunnel to get goods to and fro. “There were also suggestions of using it as a sort of conduit for air-conditioning into the Tube, to circulate cold air. That got a little way down the thinking, but eventually it fell by the way side,” he said. In fact, if anything, it’s been a bit of a nuisance at times, as other rail projects like the Tube and Crossrail have has to be factored into their building projects. “Crossrail has had to work round the Mail Rail tunnels at times… it gets very close to it. But with underground work, you can go under or over things so there are places where Underground lines pass quite close under or over,” said Taft. 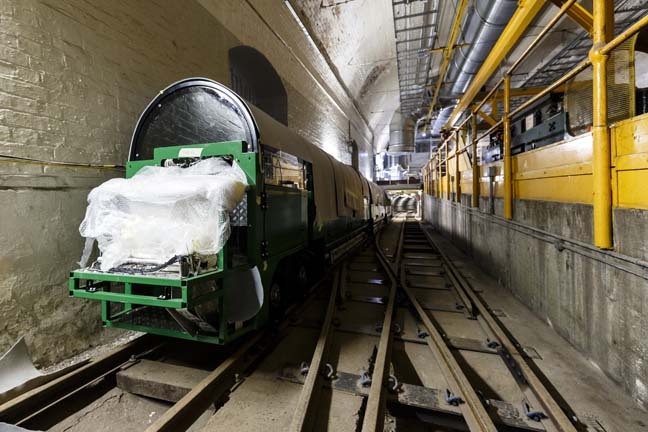 The Mail Rail tourist attraction will only use up a section of the line, leased by the Postal Museum from the Royal Mail, to carry around 20 passengers at a time on newly designed miniature trains, commissioned from transport engineering specialist Severn Lamb. The existing trains, some of which have been sold off to private owners or given to museums, couldn’t be refitted for tourists due to their size. The tube is just a single 2.7m diameter tunnel with two tracks, which then diverges into single-track 2.1m diameter tubes to lead into the station. That makes the driverless trains that run inside pretty small, although they have been used in the past to take people through the tunnels. As well as their small size, which as Middlesworth explains, was partially to give them clearance off the track due to the weight of mail inside, the trains are also driverless. For the visitor attraction, a driver is much more preferable in case of emergencies and to ensure the safety of passengers. It’s clear that Middlesworth has loved being a railwayman and will be happy to see at least part of the Mail Rail back in operation again when the visitor attraction opens next year. While what will happen to the rest of the track might remain a mystery for now, the Mail Rail tourist ride is already attracting a lot of interest and the museum is confident it will be a hit with visitors. By train:Underground to Farringdon is the closest station to Mount Pleasant. By bus: 63, 341, 19 and 38 stop nearby. Entrance for Postal Museum and Mail Rail when it opens is on Phoenix Place.